We were contacted by the distributors of this coconut charcoal and asked to do a review for the Lump Charcoal Database. After all the efforts and disappointments we have encountered over the years with Kamado coconut charcoal, we thought, "here we go again!" (You can read all the history about Kamado coconut charcoal in our review.) We were wondering if there would ever be a coconut charcoal worth reviewing and using again. 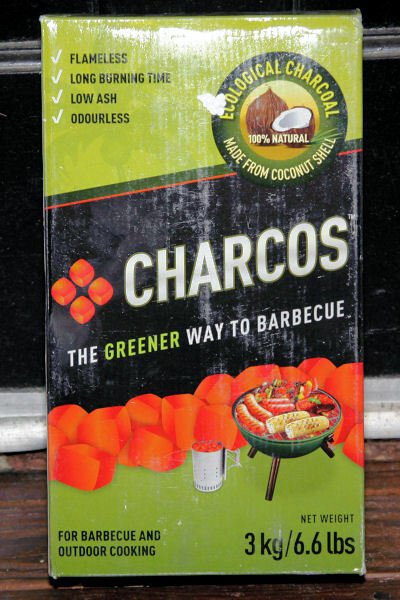 However, we reviewed the specifications for Charcos coconut charcoal and we thought there might be hope. So, once more, here we go with a coconut charcoal review! First of all, let's take a look at the individal pieces of coconut charcoal themselves. To the right you will see a photo of one piece. Click on it to see a larger version of the photo. You can see that the block appears to be relatively granular in its consistency. (Compare this to the recent dreadful charcoal from Kamado which had a soft and powdery look to it.) The pieces are 1-1/8 inches by 1 inch by 1-9/16 inches. Each piece is about 28 grams or 1 ounce in weight. They come in a box as you can see in the photo at the top of the page. Each box contains 3 kilograms or 6.6 pounds of charcoal. (10kg/22lb boxes are also available.) The blocks are packaged in three separate plastic-wrapped bundles, each containing 36 blocks. (You can see a photo of one of the bundles down below.) So a box contains 108 blocks. We have always liked charcoal in a box since it makes for better protection and is easily stackable for storage. Another thing you should notice about the charcoal is that the blocks have no hole, unlike the extruded or molded coconut charcoal we have grown accustomed to. Will this lack of a hole hurt its ability to ignite or its ability to burn hot? We were curious about these things and more, so enough speculation and trepidation. Let's get testing! As we said, the charcoal comes in small blocks, neatly stacked and plastic-wrapped in a box. There was virtually no charcoal lost to damage as there was very little powder in the bottom of each bundle. As for lighting, we placed a bundle in our chimney starter to do our normal chimney starter test. You do have to take care not to let the blocks stack up nicely against each other since airflow is critical to getting a fire going. We found it took 7 sheets of newspaper to get things going which is very high compared to all charcoals, but is pretty much the norm for coconut charcoal. The various coconut charcoals we have tested range from 6 to 10 sheets. How did it smell when burning? It had the sweet smokiness that you find with high quality coconut charcoal. We have burned and smelled inferior coconut charcoal and you just don't get the pleasant sweetness of the quality brands. In fact, some of the inferior brands actually have a somewhat unpleasant smell akin to burning cigars. Nothing but goodness here. You almost would want to burn this in your house like incense. Next, the maximum temperature test. We were stunned to see the thermometer climb to over 1070 degrees which is very hot, no matter what charcoal you are using. Just for fun, we used a high-temperature probe and measured the temperature down in the heart of the fire itself and recorded 2082 degress. This is not a test we normally run, but we have done it for a handful of charcoals including lump, briquettes, and coconut charcoal. This was the hottest we have ever measured, so obviously the lack of a hole is nothing to worry about! Next up, burn time. Another pleasant surprise. The burn time was the highest we have ever measured for a coconut charcoal, and even if you compare it to normal lump charcoal, it was high. So, let's talk about ash. One of the biggest problems with the various incarnations of Kamado coconut charcoal is the staggering amounts of ash it produces. If you want to see how staggering, watch this video that we made in which we compared the latest Kamado charcoal to the high quality charcoal that Kamado originally sold. So the first thing we did was to approximate the ash content of the charcoal by weighing a sample, burning it, and then weighing the ash. Our method produces somewhat higher values that the actual ash content since we cannot guarantee 100% combustion of the charcoal. However, we did measure an ash content about 4% which is very good. And it was therefore no surprise that the ash produced from our burn time test was very low compared to all charcoals we have tested and very low compared to most of the coconut charcoals that we have tested. Since the Charcos web site talks about grilling, we thought we would compare this charcoal to regular briquettes as it burned in an open kettle grill. In this case we used our trusty old Weber Smokey Joe. We compared burning a single layer of briquettes with Kingsford Competition, regular Kingsford and Wicked Good Charcoal briquettes. As you can see in the following graph, Charcos really performed well, burning longer than all the other brands. And after 30 minutes of burning, it maintained a hotter temperature than all the other brands, too. We will say, though, that for grilling, you probably should stick to the chimney starter method for lighting these briquettes. We dumped quite a bit of lighter fluid on a pile of these coconut briquettes, and after it had all burned off, there was only a small amount of charcoal that had ignited. It would have taken a long time to get the fire going to the point where you could cook on it. The chimney starter did a much better job. Which brings us to our conclusion. If you wanted to compare this to lump charcoal, we would probably give it a Recommended since it is so hard to light and is relatively expensive, but when you take it for what it is, coconut charcoal briquettes, this is some of the best coconut charcoal we have seen. With its long burn and low ash, this would make a great fuel for long and low overnight cooks. And as we have also seen, it burns hot and long for grilling. It definitely gets our Highly Recommended rating. "Flameless", "Long Burning Time", "Low Ash", "Odourless", "The Greener Way To Barbecue", "For Barbecue and Outdoor Cooking"
"Charcos™ is naturally produced from coconut shell, which is abundantly available throughout thousands of Indonesian archipelagos. No single tree is cut to produce Charcos™, the charcoal of the future." "1. Light Charcos™ on top of a fire source directly. Alternatively, use a charcoal chimney starter. 2. Spread the smouldering Charcols™ evenly on the cooking area. it is not necessary to stack the briquette on on top of the other. 3. Charcos™ is ready for use." centers of the two targets is precisely 9 inches.